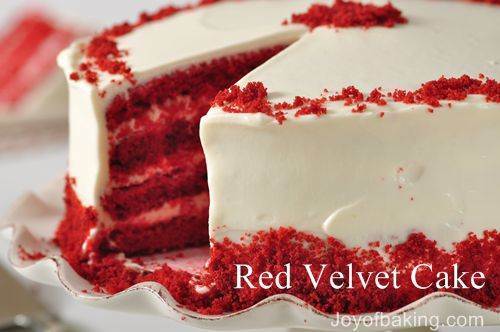 Red Velvet Cake: Preheat oven to 350 degrees F (175 degrees C) and place rack in center of oven. Butter two - 9 inch (23 cm) roundcakepansand line the bottoms of the pans with parchment paper. Set aside. In a mixing bowlsifttogether the flour, salt, and cocoa powder. Set aside. In bowl of your electric mixer, or with a hand mixer, beat the butter until soft (about 1-2 minutes). Add the sugar and beat until light and fluffy (about 2-3 minutes). Add the eggs, one at a time, beating well after each addition. Scrape downthe sides of the bowl.Add the vanilla extract and beat until combined. In a small cup combine the vinegar andbakingsoda. Allow the mixture to fizz and then quickly fold into the cake batter. Cream Cheese Frosting:In the bowl of your electric mixer, or with a hand mixer, beat the cream cheese and mascarpone cheese until smooth. Add the vanilla andconfectionerssugarand beat until smooth. Using the whisk attachment, gradually add the heavy cream and whip until the frosting is thick enough to spread. Add more sugar or cream as needed to get the right consistency. Assemble: With a serrated knife, cut each cake layer in half, horizontally. You will now have four cake layers. Place one of the cake layers, top of the cake facing down, onto your serving platter. Spread the cake layer with a layer of frosting. Place another layer of cake on top of the frosting and continue to frost and stack the cake layers. Frost the top and sides of the cake. Can garnish the cake with sweetened or unsweetened coconut. Serves 10 - 12 people.